Gangrene (gang-GREEN) is a condition that leads to the death of living tissue. It is caused by blocked blood flow or by bacterial infection. Gangrene is a condition in which living tissue (skin, muscle, or bone) dies and decays. Gangrene most often affects the legs, feet, arms, and fingers, but it also can affect internal organs such as the intestine or gallbladder. Gangrene can occur when blood flow to an area of the body is blocked or when certain types of bacteria * invade a wound. * bacteria are round, spiral, or rod-shaped single-celled microorganisms without a distinct nucleus that commonly multiply by cell division. Some types may cause disease in humans, animals, or plants. The biggest killer in the U.S. Civil War was not instant death by bullet or by cannonball: it was disease resulting from wounds. An estimated 388,500 men died from wounds and other illnesses, including gangrene. Doctors with dirty hands unknowingly infected wounds with gangrene-causing bacteria while trying to treat the injured soldiers. During this war, doctors noticed that the wounds of some of the soldiers were infested with maggots, which are the larvae of houseflies or blowflies. Those maggot-infested wounds tended to heal faster than those without maggots, because the maggots were eating the dead or decaying tissue that resulted from gangrene infection. Thus, the maggots were cleaning out the dead and decaying tissue, allowing the remaining tissue to heal. They were doing the work that surgeons do today to treat gangrene through debridement of wounds. During World War I, 15,000 miles of trenches stretched along the western front in Europe. Troops who spent many weeks in these cold, wet trenches often developed swollen limbs, damaged sensory nerves, and inflammation, a condition that they called "trench foot." Trench foot often resulted in gangrene, loss of tissue, and sometimes in loss of limbs to amputations. Physicians and military officers responded to the problem by instituting strict standards of hygiene that became part of the military's ongoing preventive health regimen. 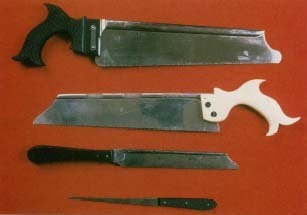 Amputation saws for treating gangrene infections were part of the military doctor's field equipment. © John Watney/Photo Researchers, Inc.
can result from injury or frostbite * , but it most commonly is a complication of diabetes. Diabetes can lead to hardening of the arteries (arteriosclerosis), which restricts blood flow. This is especially common in the legs and feet. Dry gangrene usually starts in the toes. A person might first feel numbness or tingling in the feet. As gangrene progresses and tissue starts to die, the person will experience severe pain in the affected area. Eventually, the tissue turns black, marking where tissue has died. This type of gangrene needs to be treated promptly, but it is usually not life threatening. Wet gangrene occurs when certain types of bacteria invade an injured area of the body. It occurs most often after an injury in which a body part was crushed or when blood flow was obstructed by a blood clot or a tight bandage. The lack of blood flow causes some cells to die and leak fluid, which moistens the surrounding tissue. The moist environment allows bacteria, such as Streptococci (strepto-KOK-sy) and Staphylococci (staf-i-lo-KOK-sy), to invade the wound and multiply. Wet gangrene causes swollen and blistered skin, and it has a foul odor. Once wet gangrene sets in, it spreads quickly to surrounding tissue. If left untreated, it can kill a person in a few days. Gas gangrene is a type of wet gangrene that usually is caused by the bacterium called Clostridium (klo-STRID-e-um). This type of bacteria requires very little oxygen to live, and it releases gases and toxins as waste products. Gas gangrene causes a high fever, brown pus * , and gas bubbles on the skin. When a person has diabetes, frostbite, or an injury, preventing gangrene is a high priority. Taking medications, maintaining good blood circulation, avoiding foot injuries, and not smoking are essential for preventing dry gangrene in people with diabetes. Prompt cleaning of wounds to avoid bacterial infection can prevent wet gangrene. * frostbite is damage to tissues as the result of exposure to low environmental temperatures. It is also called congelation (kon-je-LAY-shun). * amputation (am-pu-TAY-shun) is the removal of a limb or other appendage or outgrowth of the body. * antibiotics (an-ti-bi-OT-iks) are drugs that kill or slow the growth of bacteria. If a person develops gangrene, dead tissue needs to be surgically removed before healing can begin (a process called debridement). Doctors try to improve circulation to the affected part of the body and surgeons remove dead tissue. Because bacterial forms of gangrene can spread quickly, part or all of the affected limb might require amputation. * People with wet gangrene also are treated with antibiotics. * Sometimes, people with gangrene are treated in a hyperbaric chamber. This procedure exposes the body to oxygen at high pressure, which promotes healing of the gangrenous tissue.